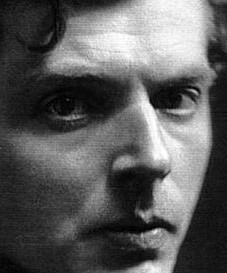 Ivor Gurney was born in Gloucestershire, and after an apprenticeship as assistant organist at Gloucester Cathedral took up a scholarship in 1911 to the Royal College of Music in London to study composition. There his illustrious friendship group included Arthur Bliss, Herbert Howells and Arthur Benjamin; a talented generation taught by Sir Charles Villiers Stanford, Sir Hubert Parry and Ralph Vaughan Williams. Along with many of his contemporaries, studies were interrupted by war service, and he served in France from 1915 - 1917, before being discharged with shellshock, and the lingering effects of a gas attack. He had struggled to maintain mental stability before the war, suffering from 'nerves' and 'neurasthenia', and the years immediately succeeding the armistice saw both prodigious creativity, and increasing illness; culminating in his committal to an asylum in 1922. He was never to be released from institutions, but his work continued for a surprising length of time, despite the dual disabilities of mental deterioration and lack of a critical audience. Some of his best-known war poetry was written retrospectively from within the asylum, and his mature work is characterised by his preoccupation with rewriting his war experiences, and his lifelong passion for the beauty of his home county. Described at the Royal College as 'the English Schubert', his voluminous song settings display a uniquely sensitive relationship to their texts. His poetry offers highly original, often idiosyncratic insights into the appreciation of natural beauty, the experience of war, and the creative interpretation of suffering. There remains a wealth of unpublished material by Gurney, about which much remains to be said. Gurney was almost unique in writing both poetry and music, and thus provides a rich opportunity for interdisciplinary discussion. This conference aims to examine both sides of his output in equal measure, establishing a dialogue between the two, whilst placing his work against the backdrop of the early twentieth century, war and the asylum. The weekend will include papers given by international delegates, addressing many issues relevant to Gurney's life and work, poetry readings, a formal dinner, and a recital of Gurney and other English song by tenor Andrew Kennedy (Radio 3 New Generation Young Artist and winner BBC Singer of the World Song Prize) including previously unheard and unpublished works by both Gurney and his contemporary W. Denis Browne. The recital will take place in Clare Hall, and all other events and meals take place in Lucy Cavendish College, where accommodation is available.